Our church is under construction. They’re at the point where they’re moving things from the old church building into the new one. Last week they took the life-sized crucifix down and placed it over the new altar. The wall where it once was is glaringly bare. If you’ve never been in our church you wouldn’t know the difference but for those who’ve spent hours praying and worshipping in that space, well, it’s just not the same. A few weeks ago I was talking with a friend from church. We were sharing some of the challenges we’d both faced in the last year and how often we’d found ourselves on our knees before the cross. I smiled as she talked about her prayer time. Her words express exactly why I’m so fond of that crucifix and any crucifix for that matter. No matter what trial or suffering I may face in this life, it will never surpass that of Jesus. He gets it. He knows my pain. He knows what it means to love and forgive those who’ve hurt you even while they continue to hurt you. He knows the anquish of rejection, hatred, and the unfaithfulness of friends. He knows the suffering that comes with intense physical pain. The crucifix reminds me of these truths. It tells me I am not alone but instead I have a friend that loves me so much He was willing to undergo great suffering to prove it. The crucifix reminds me that even though he was tempted in his own suffering to find a way of escape he chose the path of sacrificial love instead. And now I am free to do the same–to bear my own cross with as much love as He bore His. This is why the crucifix has such meaning to us Catholics. And it’s why that wall in our sanctuary seems so bare without it. Yes, I know, with or without it, the truths remain but I miss this beautiful and humbling image of suffering and sacrificial love. I look forward to moving into the new sanctuary and seeing that cross again. Meanwhile when I kneel in church and see that empty wall I will follow the spiritual direction of St. Francis De Sales. 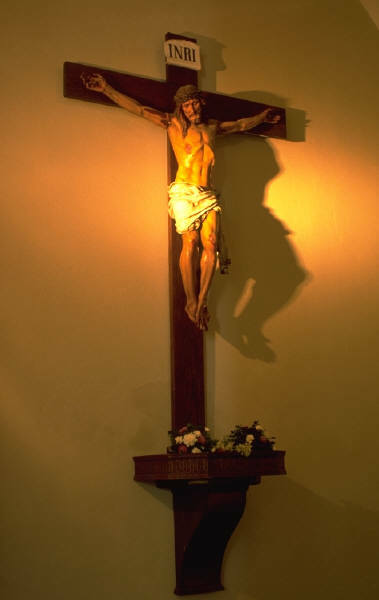 With the interior eyes of your soul, contemplate Jesus crucified, naked, blasphemed, calumniated, abandoned and overwhelmed with all kinds of disgust, sadness and labour. Then consider your own afflictions, which neither in number nor intensity can be compared with His, and reflect that never shall you be asked to suffer for Him so much as He has suffered for you. You are currently browsing the archives for the The Crucifix category.